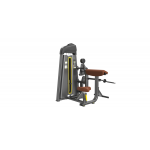 ΑXXON PRO fitness equipment is a high quality professional gym equipment that is the latest in technology and which, with proper use, ensure excellent results. Gymnastics made with a heavy-duty skeleton for real workout that enables every athlete - even the beginner - to perform an exercise in the right way, aiming at the training of specific muscle groups. From the smallest dumbbell to the most advanced electric treadmill or multi-gym, in AXXON PRO you will find a very large range of high-quality fitness equipment for personal or professional use. Specifically in our online store and in the BODYBUILDING CLUB chain stores are available all series of professional machines AXXON PRO. Silent operation, trusted dealership service covering all machines with a 10 year warranty !!! AXXON PRO fitness equipment is designed for every kind of professional use in gyms, hotels, fitness and personal studios, crossfit hals schools and of course they can meet all the needs of the amateur who want to create their own training area even at home. All of our machines are manufactured with the latest technologies and ensure durability and durability over time. As for prices, they are literally the lowest in the market, as the vision and passion of all the people of AXXON PRO is the expansion of fitness and wellness in the country and their establishment as a way of life, for better health, well-being and mood , and we at AXXON PRO are all very proud of the work we are doing ! !